Jared Hecht ’09 does sleep. Some nights. As for how many hours a day he works? “All of them,” he says. Many 24-year-olds living in New York would sympathize. But few can say they’re running their own start-up valued at a reported $80 million. In May 2010, Hecht co-found­ed GroupMe (groupme.com) with 29-year-old Steve Martocci as a group text messaging ap­plication that allows any phone (smart or otherwise) to function like a chatroom. Users form groups and can see and respond to all the text messages sent to each other. A year-and-a-half later, the app boasts users in more than 90 countries with at least 100 million messages sent per month. Like many inventions, GroupMe was inspired by love. Hecht’s now-wife, Carrie Weprin, didn’t have a good way of keeping in touch with friends at a concert; festivals are notorious for shaky phone and Internet service. Hecht knew they could solve the problem over basic text. He enlisted his good friend Martocci, the lead software engineer at Gilt Groupe, and a few weeks later, they developed a group messag­ing prototype. Within a week, the app had changed the way Hecht and Martocci communicated. By Au­gust, they had quit their jobs at Tumblr and Gilt Groupe, respec­tively, met with venture capital investors and raised $850,000. In September, they launched the beta version of the app and users skyrocketed beyond what they ever imagined. What started out as a convenient way to keep in touch with friends at music festivals evolved into a life-changing system for stop­ping crimes in a neighborhood watch and coordinating relief efforts after natural disasters. By December, Hecht and Martocci had raised another $10.5 million of financing from investors. Then, almost a year after the launch, and with competitors such as Facebook, Google and Apple working on their own group messaging services, GroupMe was acquired by video phone giant Skype for a reported $80 million. “What was most important to us was making sure people all over the world can experience GroupMe, and we wanted to take every competitive advantage we had to make sure that happened,” Hecht says. 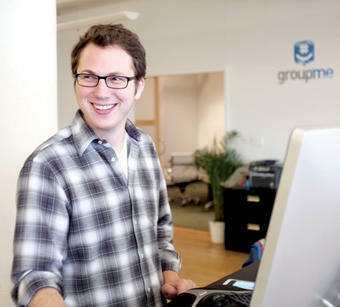 GroupMe co-founder Jared Hecht ’09 at his sleek Flatiron office. PHOTO: GROUPMEThough his baby face and typical sweatshirt-and-jeans at­tire suggest an amateur, Hecht has been honing his entrepreneurial skills since college. Work­ing his senior year as manag­ing director and publisher for Columbia’s student-written and produced guidebook, Inside New York, provided him the foundation for running his own company. As part of the Center for Career Education’s (CCE) Student Enterprise program, Inside New York was founded to develop management skills through student-operated businesses. “I was running a business with real revenue and a real product that was distributed with sig-nificant impact,” Hecht says, reminiscing about receiving his own copy during freshman year orientation, which he referenced throughout college. Dean of Ca­reer Education Kavita Sharma and senior associate director Beth Vanderputten served as mentors. “They were the safety net, and that was a rare op­portunity to have in business,” Hecht says. The political science major oversaw finances, managed a core staff of 20 daily as well as 30–50 freelancers, built a sales team and entered new markets. Under Hecht’s leadership, Inside New York evolved into the in­tercollegiate guidebook to NYC with writers contributing from schools such as Fordham, Pratt and NYU. In addition, Inside New York finally developed a digital presence beyond a static Contact Us page. For the first time, all reviews were pub­lished online, along with a blog that was refreshed throughout the academic year. “We wanted to be competitive with Spectator and Bwog — something students paid attention to day in and day out — and not just Columbia stu­dents,” Hecht says. Aside from inspiring him to one day start his own business, the experience had a more direct effect: Hecht was personally recruited by Tumblr president John Malo­ney to join its tech start-up after Maloney heard about Hecht’s leadership with the publication. After a year of accumulating tech savvy as Tumblr’s business develop­ment manager, the idea for GroupMe came along. Yelena Shuster ’09 is a free­lance writer whose work has been featured in Manhattan magazine, The Fiscal Times and Cosmpolitan.com.